Blindes Huhn Extrem is a second generation game of the somewhat classic 1997 trick taker Blindes Huhn. Germans apparently have a thing about games involving blind chickens – and there are actually multiple unrelated games with the same title. However, as I mentioned earlier, this is a re-do of the card game by the same designer. In this game, a deck of numbered cards (from 0 to 49) is dealt out to the players. 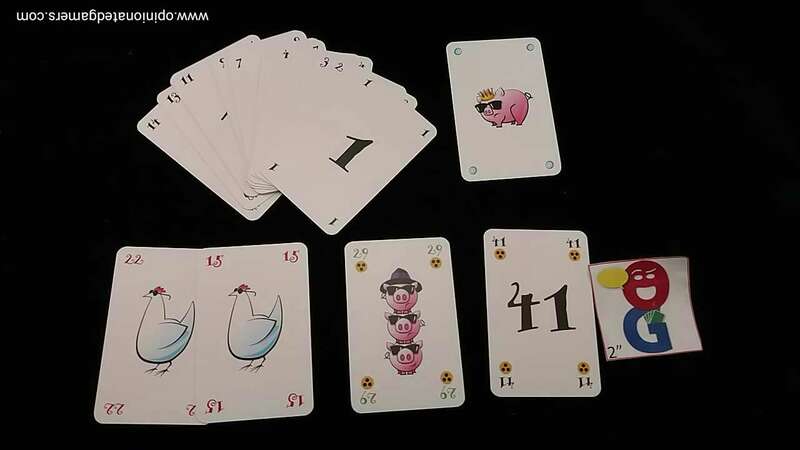 Ten of the cards have blind chickens on them, three of the cards have pigs on them and the 0 card has a sow on it. Some of the cards also have a yellow “play facedown” icon on them. Certain cards are removed based on the player count so that all players have the same number of cards in their starting hand. Once the cards are dealt, players get this opportunity to re-arrange the cards however they want. However, once the hand starts, the relative order of the cards cannot be changed. Players will always be limited to playing either the leftmost or rightmost card in their hand. The player to the left of the starting player leads the first trick. He can play either his leftmost or rightmost card. Cards are generally played face up to the table though any card with the yellow “facedown” icon are played facedown. Play goes clockwise around the table with the same playing restriction. Once all players have played a card to the trick, the player who played the highest numbered card wins the trick (any facedown cards will be revealed at this time). He will collect all the played cards and will lead the next trick. 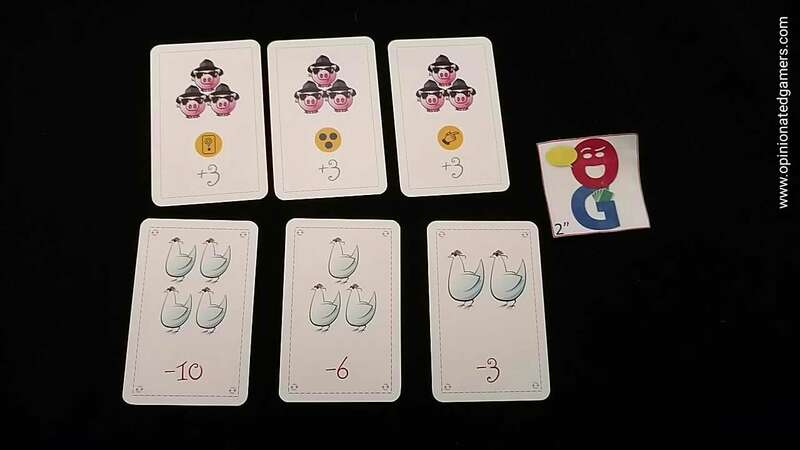 If the trick contains more than one blind chicken card, the winner must also take a penalty card from the supply which matches the number of chickens in that trick. Place this card face up on the table with the appropriate number of chickens showing. There is a negative point value shown on the penalty card. If the trick had a single pig card in it, the trick winner collects a reward card. All reward cards are worth +3 points. Each also comes with an immediate special ability that is put into play: the player can lead the next trick with a facedown card, the player can choose any card from his hand – not just the leftmost or rightmost OR the trick winner can choose which player leads the next trick. Play continues until all cards are played from the hand. There is one special rule concerning the final trick. If both the 0 and the 49 are played on the final trick, the 0 card wins (instead of the usual rule of the highest card winning). The winner of this final trick then gets to make a special decision. He can either nullify all chickens taken previous to this final trick OR he can nullify all penalty cards taken previous to the final trick. A third option is available if the final trick is won with the “0” card – this player can choose to wipe out the score of an entire previously played hand. The game is played over a number of hands equal to the number of players. The player with the highest point total is the winner. 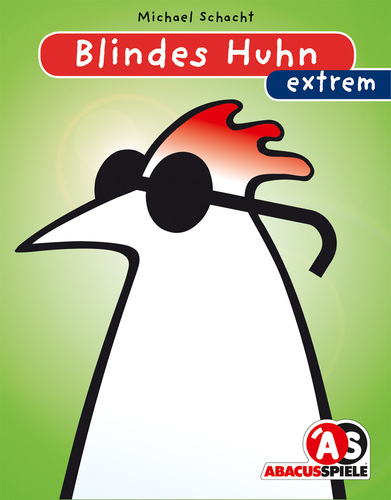 Blindes Huhn was one of the first card games I can remember importing from Germany – either through a used game mailing list (does anyone else out there remember Wilifred?!) or via a huge AdamSpielt order. At the time, I remember being amazed by the idea of playing a card game where you didn’t reorganize your cards. Though I’m not sure, I’m guessing that I came across this before I played Bohnanza. This new version adds a few twists to the game that both simplify as well as complicate the game. The individual trick scoring makes things a bit easier to figure out. In BH Extrem, when you take multiple hens in a trick, you take a penalty card from the supply corresponding to the number of hens you took. In the original game, you’d set the trick aside and then multiply the number of hens by the number of eggs in that trick. For me, just being able to add up the scoring cards is way easier to deal with. The pig cards are a new element as well – giving the players some incentive to want to take tricks. The special powers can be pretty useful, and if you can get a pig trick with a minimum of risk, it’s probably worth it for that special ability. I’m not as sold on the final trick shenanigans. While it’s a neat thing to be able to win a trick with the zero card AND even better to wipe out an entire hand’s worth of scoring, it doesn’t seem to pan out that much. Usually, the player with the 49 makes sure to take a trick at some point earlier in the hand to ensure that the 0 can’t win a trick at the end OR the zero gets sloughed off at some point earlier in the hand to ensure not winning a particularly bad trick. I suppose that it shouldn’t matter much if I haven’t seen it happen a lot – but this whole thing seems to add a lot of time onto the rules explanation as I have to make sure that everyone understands how it works! Overall, Blindes Huhn Extrem is a pleasant trick-taking game. It offers a few twists from the original, and I think that I would prefer to play this one over its predecessor because the majority of scoring is simpler to manage. “huge AdamSpielt order” – ah those were the days! “Blindes Huhn” is a common expression, derivated from the expression “Ein Blindes Huhn findet auch mal ein Korn”, meaning even when you dont know what youre doing, you might still get something right occasionaly (literally: “A blind chicken sometimes also finds a piece of grain”). Since the idea that you might win something due to pure luck is something very “game-y” its no wonder, there are several titles with this expression! Peer – thanks for the German idiom lesson – I knew there had to be a reason!